Slob hunters and poachers generally travel by pickup or some other form of mechanical conveyance and if you take their wheels out from under them, they’re helpless. An even more sinister and despicable “hunter” is the trapper. Trapping is cruel, serves only greed and vanity, and disrupts the population balance of important carnivorous “furbearers.” The leg-hold trap should be outlawed. But until that glad day, you can stop the trappers yourself in your neck of the woods. Be careful. These good of boys are armed and have the law on their side. Don’t end up with your hide nailed to some yahoo’s barn door. By using the following, field-tested techniques, you can make trapping diffi­cult-if not impossible-for even the most experienced and dedicated trapper. Remember the wolf. One of the most widespread assaults upon the Earth and its creatures is trapping. Fur trappers kill whatever animals bring in the dollars, not the often ­hyped “damaging” predators or overpopulated species. Regulation by state game departments masquerades as “scientific management,” when in reality no reliable population figures or no significant studies of the impact of trapping on target species are available, and trapping regulations in the field are seldom enforced due to the scattered and widespread nature of this destructive activ­ity. Many states set no limits to the killing of Coyote, fox, Badger, and numer­ous other species. The attitude seems to be “the only good one is a dead one.” Only the strength and resilience of Mother Nature keeps many animals from following such once-common animals as the Gray Wolf down the slow path toward extinction. These grim statistics are repeated in state after state, and must be added to the death toll of federal “predator control” programs that can destroy over 100,000 coyotes in a single year. Your state game department has published figures on the reported kills in your area. How is this slaughter accomplished? First, you must realize that the great majority of licensed trappers are ama­teurs, school kids, and part-timers whose techniques are crude. Consider, however, a typical Coyote’s experience with a professional trapper of consid­erable ability. Coyote’s first sign of danger is the snap of steel jaws as the leg-hold trap seizes a toe, foot, or leg. Filled with pain and fear, the Coyote tries to flee. If the trap is chained to a stake, her attempted escape is short-lived. If the trap is attached to a drag (a hook or anchor-like device on the end of a short chain), the Coyote instinctively runs for shelter, dragging the trap until the hook snags in brush to hold her fast. At this point, the actions of a trapped Coyote vary widely. Some lie down and quietly await death. 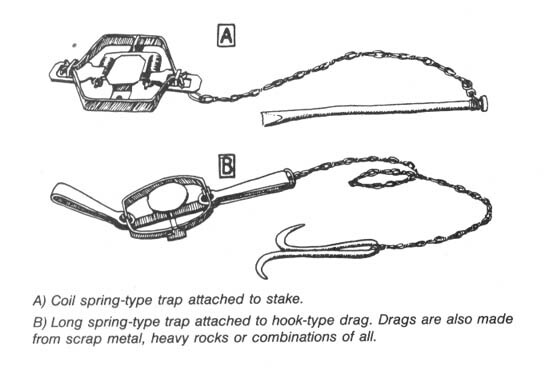 Although most states require periodic checking of traps, there is no realistic way of enforcing such rules in the backcountry. It is not unusual for a trapped animal to spend two or more days locked in the grip of a leg-hold trap. When bad weather sets in, as it often does in the prime winter trapping season, the wait grows longer. Trapping authorities often recommend leaving the animals to freeze to death while trapped, which eliminates the need for killing by gun or club and thereby insures an undamaged pelt for market. Most trapped animals fight the trap to some extent. “Wring-off” is a trappers’ term used to describe the animals whose twisting, biting, tugging, rolling, and chewing causes them to sever or amputate the toes, foot, or leg held in the trap. Although some animals crippled by their escape live to hobble around for many years, most die of infection or from starvation due to impaired hunting ability. The Coyote who remains in the grip of the trap until the trapper’s arrival will usually be killed in one of two ways. If only a couple of toes are caught in the trap, the professional will use a .22 rifle to make the kill so that his approach does not frighten the animal into pulling free. Unfortunately for the trapper, this method can damage the pelt. The most popular method of killing involves beating the Coyote in the head with a long stick or club. Although some trappers beat the animal to death in this manner, the professional strives to merely stun the animal or knock it un­conscious. He will then stomp on the rib cage or kneel on it in order to crush the chest cavity and cause death by internal bleeding (the blood often fills the lungs and causes death by suffocation). Also common to trapping is the death and injury of so-called “non-target” and “trash” species. These are any type of animal, including house pets, that the trapper does not want to catch. Skunks are often the first animals to investi­gate a trap line laid for Coyote and Bobcat, and the trapper may virtually eradi­cate the skunk population to get to the furbearers he wants. Trapped skunks may be carved up and used as trap bait, so investigate the ground around any skunk remains. With the professional and amateur trapper alike, the non-target animals con­stitute between one-third and two-thirds of the animals trapped, and include deer, squirrels, skunks, ravens and crows, hawks and eagles, pet dogs and cats, and others. Perhaps most amazing is the way that trapping has persisted in the face of widespread public opposition. An extensive federally-funded survey con­ducted by Dr. Stephen R. Kellert of Yale University found that 78 percent of the public opposed the steel-jaw trap. In addition 57 percent disapproved of killing furbearers for clothing. Almost two-thirds of the trappers indicated that they did most of their trapping between the ages of 13 and 20, and a whopping 86.4 percent reported that trapping has never been a major source of income for them. Even a survey conducted by the American fur industry found that less than 3 percent of trappers derived most of their income from trapping. Trapping is a mere hobby for most of its practitioners, yet one fourth of trap­pers surveyed by a major trapper’s magazine boasted that they would disobey any law that banned the leg-hold trap. Begin your search with a trip to the local office of your state game depart­ment to obtain a free copy of the trapping regulations. This will give you an idea of where traps are set (for example: not within 25 yards of a public road or highway), when to find most of them (trapping season dates), and guidelines on the frequency with which the trapper must check his traps. If your state, for example, requires trap checks once every 48 hours, this may indicate the fre­quency with which the typical trapper takes to the field (an important security consideration). Since most trappers prefer to drive instead of walk, many trap lines are found along rural roads, powerline easement roads, ranch roads, and roads that dead-end at abandoned mines and such. In tall timber, old logging roads and firebreak roads are favorites. In the desert regions, dry streambeds dou­ble as roads. Because of this, you should be suspicious of any slow vehicles cruising these types of roads. Favorite trapper vehicles include pickup trucks, assorted four-wheel drives, and station wagons. All of these provide a space to haul equipment and animal carcasses. Sometimes a peek into the back of a camper shell will reveal traps, chains, and other indicators. Some trappers don’t bother to clean off the telltale bloodstains on the backs of their vehicles. Most trappers who work along roads observe their trap sites from their vehi­cle, sometimes with the aid of binoculars. Therefore be alert for any sight or sound of approaching cars and trucks. In more densely-populated areas, like the Eastern states, a trapper is more likely to park his vehicle and make a walking circuit to check his traps. Some also use horses, dirt bikes, and the three and four-wheeled all-terrain vehicles. Look for signs of a large pack or trap basket used to carry equipment and hides. In the north country, many trappers use snowmobiles, often setting their traps near snowmobile trails which are favorite travel paths of Lynx. Because the vast majority of trappers work their lines on a part-time basis, they often check their traps before going to work in the morning (this also limits the loss to trap thieves who steal the trapped animals). A hand-held spotlight can allow them to check their traps in the pre-dawn darkness. Trappers are most active on weekends and holidays. Be extremely cautious at these times. Trappers range in age from 10-year-olds to senior citizen pensioners. Most live in rural areas and small towns. In many areas, state wildlife officers are among the most avid trappers, cashing in on their job-related knowledge of wildlife habits and locations. A) Bait set using small animal or piece of meat suspended from tree limb. B) Set near where animal path crosses dirt road. Also used where culverts cross under roads. C) Traps set near where two streams or arroyos meet. D) Trap set on trail. Sharp rocks and sticks placed on trail force animal to step on clear spot where trap is hidden. rock is sometimes placed on top to keep animal from digging after bait from above. G) Trap set under remains of campfire (usually used to trap fox). H) Lure or scent sprayed under cow chip or flat rock propped up with stick. This keeps rain from washing away scent. J) Multiple sets used around dead animal (horse, cow, deer, etc.). Scent or lure also sprayed on nearby scent posts. direction only. 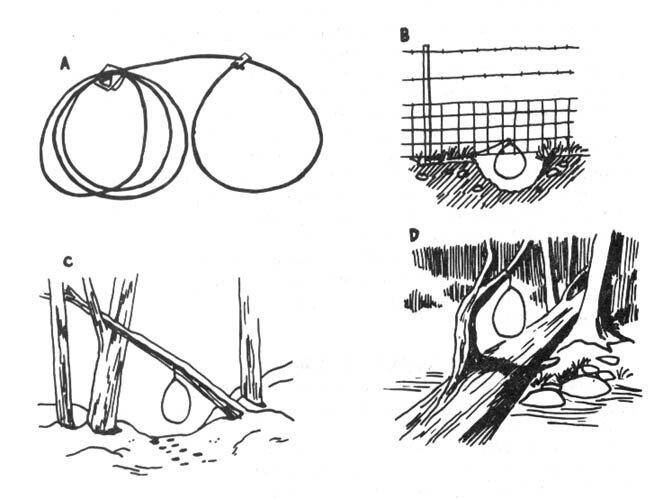 Illustration shows bird wing nailed to tree as bait. L) Trap set on slide used by muskrat, otter or beaver along streams. M) Trap attached to log partially submerged in stream or pond. N) Trap set on beaver dam. Be suspicious of any small markers like strips of cloth, plastic flagging, or wire twist-ties that you find attached to barbed-wire fences or tree limbs alongside roads. These markers are used to sight along by trappers whose sets are back away from the road. Experienced trappers favor trap sets near natural animal pathways like deer trails, cow paths, streambeds, fence lines, and high observation points. In desert washes they favor piles of drifted brush and small brushy islands. Where other wildlife or livestock use the paths, the trap will be set off to the side to prevent deer and cattle from ruining the set. Small clearings, holes, and bare patches of dirt on snow-covered ground are ideal for traps. Sometimes a small piece of cloth or strip of light-colored fur will be hung above a trap to lure in the curious predator. Some trappers carry animal drop­pings and set them near the trap as an additional lure. After a trap is buried, the surface will be restored to its normal appearance, making it difficult to spot. Use your foot inside heavy boots (not running shoes!) 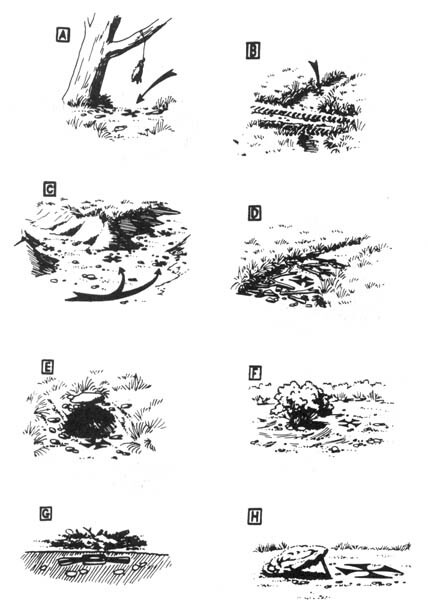 to probe suspicious areas like slight depressions, small clear spots surrounded by twigs and rocks (designed to make the animal step on the attractive clear ground), or around holes (any hole-animal or man-made). Many traps are set beside a “backing” like a rock, bush, clump of grass, or embankment to insure that the animal approaches the bait or scent lure from one side only. Trap line saboteurs have also used leashed dogs and metal detectors to locate buried traps. Where you find one trap, you will usually find more. Traps are commonly set by twos and threes within a small area. As many as ten can sometimes be found within a 100-yard radius. Trap line saboteurs can walk or drive through suspected areas. Cross-coun­try skis can be used to quietly prowl along snowmobile paths. Consider carry­ing a white bed sheet in your pack to use as quick camouflage if you hear 81 snowmobile approach from afar. Motorized road patrolling is best done with two people, one to remain with the car or truck as a lookout. A cheap plastic whistle can make a good warning signal. Always have a good reason to give for being in the area. Props like binoculars, cameras, bird books, and the like make it more convincing. One trap line saboteur carries a partial roll of toilet paper as a prop to explain what he’s doing back in the weeds off the roadside. Mountain bikes, or just an old clunker from the Goodwill store, provide a silent way of prowling roads while keeping an ear cocked for the sound of an approaching engine. To avoid leaving telltale tracks, ride only in the other tire tracks so that the next passing vehicle will erase signs of your passing. If you wish to stop and check an area more closely, do not ride off the road. Stop in the track, pick up your bike and carry it into the brush, stepping carefully on rocks, twigs, and clumps of grass to avoid leaving obvious footprints. Soft soled moccasins leave a minimum of footprint, and you can quickly change into boots when you’ve found an area likely to contain traps. You can determine trap locations by careful surveillance of suspected trap­pers. Observe from a safe distance to see where the driver slows, stops, or uses a spotlight to observe trap locations. If the trapper checks his traps every morning, or on weekends, find an observation post on high ground and use binoculars and a note pad to chart his movements. If you know where a trapper lives, you can piece together his route. Follow him a short distance when he goes out. Next time, pick him up again where you left off last time and follow another short distance. In this way you can gradu­ally determine his trap line route without betraying your interest. Trappers’ home addresses can be determined in many ways. Some states require the trapper to put his name and address on a plate on every trap. An inflammatory anti-trapping letter in the local newspaper may draw trappers out of the woodwork with their defensive responses. Telephone inquiries can reveal who is buying furs in your area. Sometimes these brokers will visit an area for a few days and purchase furs at a prescribed meeting point. These fur sales, and meetings of trapper clubs are good places to obtain license plate numbers for use as described in the Intelligence section of the Security chap­ter. Also, don’t ignore the fur business infrastructure. There are about 30,000 “country collectors” operating in the U.S. who buy directly from the trappers. They in turn sell to a broker or auction company. [In many small towns in the rural West, the visit of the “fur buyer” is announced in advance in the local newspaper or on community bulletin boards and is an event of major social importance.] Once you have located these smaller buyers, call them to obtain the names of the brokers or auction companies to which they sell. You could pretend to be an exclusive clothing shop owner or a clothing designer looking for a volume dealer. The “pretext” phone call is a tremendously valuable intelli­gence-gathering technique, so practice in advance to sound convincing. Also, infiltrate a fur auction or the pre-arranged gatherings where trappers sell their goods. Pretend to be a novice trapper and keep your ears and eyes open. Use the intelligence-gathering methods described elsewhere in this book to follow up such leads as names and license plate numbers. Locating a trap with your boot or a stick will trip it and thus render it ineffec­tive until the trapper comes around next. This method is not effective for long, and if repeated regularly, may cause the trapper or state game agents to put the trap line under surveillance. Furthermore, any type of trap line interference is illegal, so you might as well do a thorough job and totally dispose of any traps you find, as this is no more illegal than simply tripping them and leaving them intact. Although no tools are necessary, a pair of “linesman’s” pliers, with their dual plier/wire cutter head, is handy for cutting traps off chains or pulling out trap stakes. Do not carry them in plain view, of course. Only removal or destruction of a trap will insure that it is not used again. Removing all the traps could have the added benefit of financially crippling the trapper. Rather than destroying a trap by loud hammering or pounding, quietly disposing of it is safer. Traps can be gathered and buried in well-hidden locations. After removing the trap from its set, restore the area to its exact appearance before your arrival. Remember that experienced trappers can follow your tracks and recognize disturbed ground. Carefully brush out your footprints at a trap set. Practice walking without leaving obvious traces. Study your own and other people’s tracks to learn what types of surfaces show sign clearly, and learn to use rocks, logs, pine needles, clumps of grass, etc., to avoid leaving tracks. Wear soft soled moccasins for the approach. Learn to walk slowly and carefully, applying your weight evenly to the whole sole to avoid leaving deep toe or heel impressions. Tracking pursuers can be thrown off by frequent and irregular changes of direction. When you first start back to home or to safety, walk in an entirely different direction and gradually zigzag back. Small deviations to one side or another of an obvious path of travel will fool no one. Think like a tracker. Also, make sure you know the area well enough or have map and compass to avoid getting lost in the woods. If you know that you left distinctive tracks around the trap line (perhaps before you first discovered a trap) avoid wearing the same footwear in that area again. Unearthed and tripped traps can be disposed of by tossing them into ponds or streams where they won’t be visible from the bank. Or they can be thrown into heavy brush far away from the trap line. Remember not to leave finger­prints on a trap. If you don’t have gloves with you, use a bandanna, handker­chief, or even some toilet paper to handle the trap. 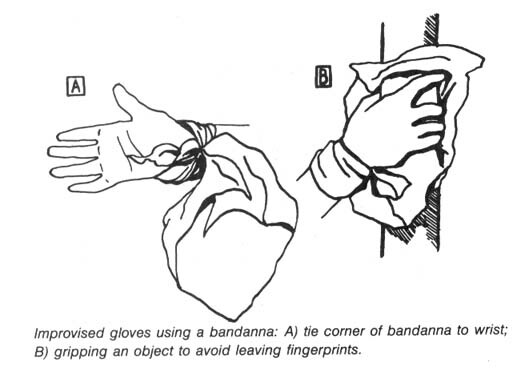 See the illustration showing how to make a bandanna into a field expedient glove. Keep in mind that where you find one trap, there are probably more. Always be alert for the trapper checking his line. Take cover if you hear a vehicle or person approaching. Remember that some trappers check their lines from afar using binoculars. A simple walk in desert or forest might someday lead you to an encounter with a trapped animal. Naturally, trap line sabotage greatly increases the odds. In some states, it is a felony to free an animal from a trap, although we know of no person being convicted of releasing a trapped animal for humane rea­sons. Visit a state game department office (in a distant city to better protect your identity) for a free copy of your state’s trapping regulations and laws. There are several ways to release a trapped animal, but we cannot recom­mend the method used by an elderly Texas woman who quietly approached a trapped Coyote and released it without a fuss. A trapped animal is probably frightened and in pain and might attempt to bite or scratch you. Be cautious. One release method involves throwing a coat or tarp over the animal’s head to calm it down and put a barrier between its jaws and the trapped limb. If two people are working together, one should focus on restraining the animal while the other effects the release from the trap. Avoid any animal foaming or froth­ing at the mouth as this may be a sign of rabies (the odds of this are very slim). Once the animal is free of the trap, step back and allow it to run out from under the coat. # 1) Hardwood walking stick with two inconspicuous holes drilled in shaft to accommodate eye-bolt hardware. Carry hardware, rope and wrench in pack or pocket. Can be assembled in two minutes. Walking stick can also be used to probe for traps. #2) Variation of # 1 using only one eye-bolt. In place of second eye-bolt guide, wrap rope loosely around shaft. Knots on cord allow for sure grip. 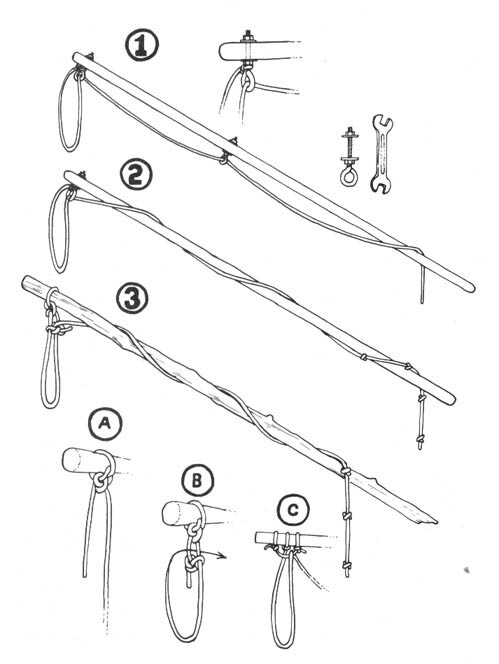 #3) Field expedient noose stick. Be sure to select a strong and relatively straight stick or branch. A) Tie one knot leaving several inches free on end. B) Tie second knot to long cord which then loops back through. C) Variation using a short cord to make a loop guide for noose. To meet the need to conceal an anti-trapping noose pole in a small car or a backpack, this collapsible noose pole was designed. Made of thick-walled PVC pipe, it is extremely lightweight and can be assembled in less than an hour with materials costing less than ten dollars. All the materials can be bought at any hardware store, but to avoid suspi­cion, spread your business around to different stores. Materials: One length of 1 /2 inch (internal diameter) Schedule 40 (thick, not thin-walled) PVC pipe (you will use only 3 – 5 feet). One end cap for pipe (Illustration A). Two or three screw coupler sets (Illustration D). Four feet of 1/8 inch braided steel cable. One cable “stop” for the above (Illustration B). One cable “ferrule” for the above (Illustration C). Four or more feet of 1/4 inch braided nylon rope. PVC solvent and cement (for assembling pipe pieces). As you can see from the diagram, the end cap is drilled with two holes to pass the noose cable through (A). Before gluing the cap to the end of the pipe, place the cable stop (B) on one end (crimp it to the cable with a couple of ham­mer blows), and crimp the other end into the ferrule, along with one end of the nylon rope (C). Pulling on the rope will tighten the noose. Cut the PVC pipe into the lengths you require. Think about this first. If you plan to carry it inside a small pack or under a car seat, measure the space first. Then size your individual segments accordingly. If the sections are longer, you may want to go with three pieces; if shorter, try four segments. Don’t be surprised if they don’t screw together completely and some thread shows. Into the end of the last section cut two notches about an inch deep to accommodate the nylon rope (E). Tie knots into the end of the rope at intervals of about one-and-a-half inches. When the rope is slipped into the notch in the pipe, the knot will not pass through and will lock the noose tight around the neck of the animal you are rescuing. A sturdier, heavier, and only slightly more costly version of this noose pole can be made by substituting galvanized pipe for the PVC. Look for the less­ conspicuous black-finish galvanized pipe. Have it cut and threaded at the store where you buy it. 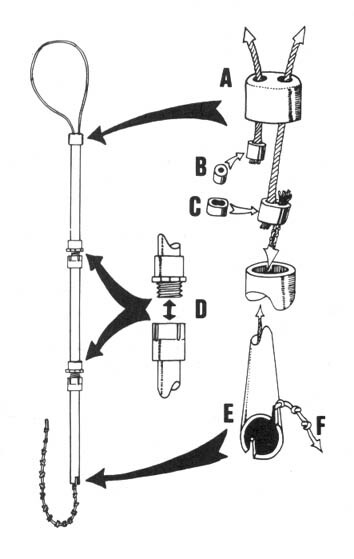 A simple noose pole can be improvised from a shock-corded aluminum tent pole. Also see the illustration for Simple Noose Sticks. to calm down. See instructions for tightening the noose until animal is uncon­scious, but take such extreme measures only if really necessary. Store your noose pole in a cloth bag to keep your fingerprints off and to keep dirt and grit from fouling the pipe threads. If confronted, say you carry it because you’ve had to release your pet dogs from traps before. Approach the animal slowly with your noose pole extended to the front. If the animal is agitated, softly talking to it or quietly humming can have a calming effect. Some animals will sit still, paralyzed with fear, while others will struggle and try to pull away. Tighten the noose around its neck, then restrain the animal to prevent it from injuring itself by struggling. Usually you can push the animal’s head to the ground and step on the trap springs with your feet to effect the release. If the animal struggles, you may have to cut off its air by tightening the noose. The animal will pass out and go limp. Loosen the noose immediately, but only slightly, to permit the unconscious animal to breathe again. The animal will recover in a few minutes, after you have removed the trap. Remember, though, that they may revive at any time. When actually loosening the trap by stepping on the springs, you may find that a previously docile animal begins to struggle. Sometimes the trap cuts off circulation, eventually deadening the pain. As the pressure of the trap jaws is released, the revitalizing blood flow can cause extreme pain in a paw that is swollen, cut, or broken. Be prepared for an animal to suddenly struggle or attempt to bite (even pet dogs often react this way and bite their people). Before releasing an animal from the noose pole, make sure it has a clear escape route away from you. An additional aid for releasing trapped animals is a heavy coat or tarpaulin. Throw this over the animal to calm it. This can be especially helpful when releasing cats or birds of prey, as the cloth can prevent them from scratching with the free foot. EAGLES, HAWKS, AND OTHER BIRDS – Some scumbag trappers still use dead animal baits that lure curious birds of prey, ravens, vultures, and others into the trap jaws. (The so-called “mountain man” Claude Dallas, who murdered two game wardens in Idaho, was such a man.) To avoid their claws during release, grab the wing opposite the trapped leg and stretch the bird away from that leg before releasing the trap jaws. Eagles are very powerful and difficult to release. Cover the free leg with a coat or heavy cloth and hold it alongside the trapped leg to prevent scratching. Step back quickly when releasing an eagle. Heavy leather gloves help protect you from scratching. The best type are heavy welder’s gloves with gauntlets that protect the wrist. PORCUPINES – Gloves are no protection against porcupine quills, and you should never throw a coat or cloth over a porcupine as this can injure the ani­mal by pulling out quills. 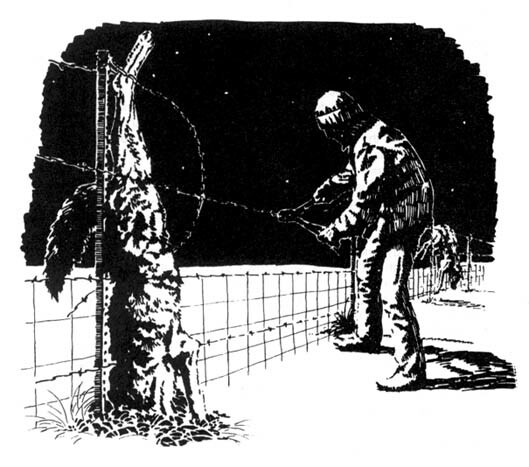 A noose pole can be used to stretch the victim away from the trap by snaring the tail or a back leg. Since porky often protects itself by turning its back and raising its quills, one person can hold the tail down with a stick and then carefully grasp the long hairs and quills (when grasping, move your hand slightly to the rear, in the same direction as the quills). Lift the por­cupine by the tail, using the other hand to support the abdomen. A second person can then release the trap jaws. BADGERS – The Badger is one of the toughest critters around and must be handled accordingly. Even finding them can be a bit of a problem. A trapped Badger usually tears up everything within reach, leaving a circle of torn-up earth around the trap. Sometimes a Badger will succeed in burying itself in the loose dirt. If you find this torn-up circle and no Badger, use a long stick to probe the loose earth. If you still find no Badger, it may already have been killed and taken away. Check the vicinity for new trap sets. SKUNKS – Only the bravest and kindliest souls release skunks. Our expe­rience with live-trapping skunks to remove them from civilized areas has shown that their temperaments vary. Some are calm as house cats, while others show total panic. It is possible to lure the skunk into several spraying attempts to “empty” it out (severaltimes). 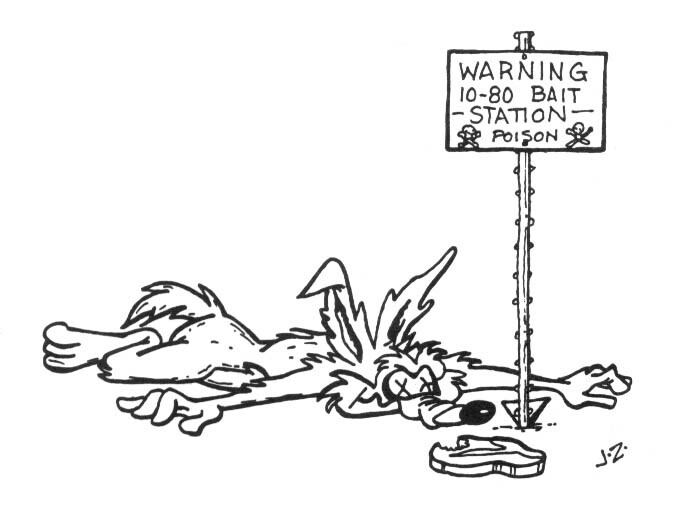 Be prepared to move fast and remember that skunks can spray as far as 12 feet. For more information on trapping, consult your local library. Do your reading at the library, if possible, to avoid leaving a check-out record showing an inter­est in the subject. At bookstores look for a trapping book with information on trapping the wildlife found in your area. The monthly magazine Fur-Fish-Game (which can be purchased anonymously at a newsstand or grocery store) regu­larly has trapping tips, advertisements for suppliers, and dates and locations for trappers’ conventions (use your imagination here). * A skunk’s spray not only sticks to your clothing, but also penetrates your clothes and sticks to your skin. Therefore, a non-permeable garment is needed. You are probably not one to ruin a good rain suit on every trapped skunk you come across. Also, wearing nylon on the job is a no-no. There is an alternative: military chemical warfare gear. It is not terribly expensive ($15 or less) for a matching set of coat and trousers. They are said to be impenetrable to nerve gas, chlorine gas, and mustard gas-and they work well with skunk spray, too. Old worn sets, though, are worthless! Buy only those sealed in their original package. Never launder this stuff either, or you’ll take out the protective chemical. It is also wise to get a good gas mask. Surplus Israeli Civil Defense masks are now available from many sources (mine cost $7). So: buy local, pay cash, and remember the words PAPER TRAIL. Good luck and happy trails. When you discover a trap line of any type, careful surveillance of the trap­per checking his traps may reveal still more sets. Watch to find out when he checks his traps. Check all likely locations for traps. Use a couple of short poles and your feet to probe sections of game trails. Check the entrances to culverts and under bridges. Look for low spots under fences. Bodies of dead animals, chunks of meat, or feathers might be suspended from bushes over buried traps. Some trap saboteurs have used a dog on a leash to locate .traps set for Coyotes. The dogs found traps carefully buried next to small bushes or tree stumps that were sprayed with urine from captive coyotes, making false “scent posts” that attracted every curious Coyote in the area. Two pairs of vise grips make the job of extricating an animal from a trap quick and easy. Simply apply a vise grip to each pair of springs on the trap. Perhaps Coyotes under pressure from “varmint hunters” can be “trained” to avoid the gunmen. Hand-held varmint calls and instructional tapes are available through gun shops and sporting goods outlets. Those who don’t want to learn the calling techniques, can use portable loudspeaker systems with cassette tapes in the field. Many books describe the hunting techniques in detail. With this information, the monkeywrencher can camouflage herself well, take to the field, and call up Coyotes, Bobcats, etc. A rifle or handgun used to fire blanks or even send live rounds whizzing safely past Coyote will make her be more cautious in the future, much to the detriment of the varmint calling “sportsmen.” As long as you obey state game laws (such as purchasing a hunting license), this is perfectly legal. * It may be possible to monkeywrench a trapper’s vehicle while he is away setting his traps. Since most trappers are too lazy to go far from their wheels, such opportunities are rare and risky. * “Bug zappers” indiscriminately slaughter flying insects and should be out­lawed. Until then, they should be put out of commission whenever possible. They can be taken and destroyed, or shot out with BB guns, pellet guns, or slingshots. – Follow the same roads the trapper uses. When walking, stay in the tire tracks so passing vehicles later will wipe away your prints. If driving, use a suitable winter vehicle equipped to get you unstuck. Scout your routes ahead of time to memorize the layout and become aware of road hazards that might leave you stranded. – Always have a good cover story for being in the area. Rehearse. Firewood cutting, and hunting (with rifle, license, and knowledge of what’s in season) are good covers, but don’t pretend to be another trapper. Trappers are the biggest “trap thieves” and are always suspect. — You don’t want to drive past the scene of an animal release/sabotage on your way out. Have your vehicle pointed to exit, not enter, the area. — Stop your vehicle on hard ground to minimize sign of entering and exiting. On narrow one-way roads, pull past the target a short distance and walk back. If the trapper shows up while you’re working, you may hear him stop and get out of his vehicle before he walks up on you. — Minimize footprints and disturbed ground by walking the same path in and out. This is especially important in snow. ~ Keep any equipment accessible, yet hidden, inside your vehicle. ~ If you don’t want to carry a noose pole to free trapped animals, consider a short heavy stick about four feet long with a fork on one end just deep enough to pin a small animal neck to the ground. Pin down the animal’s head and neck as far from the trap as possible. If the trap chain is taut, the animal’s trapped leg pulled straight, and the head pinned as far away as possible, the chances of being bitten or scratched (cats) is minimized. 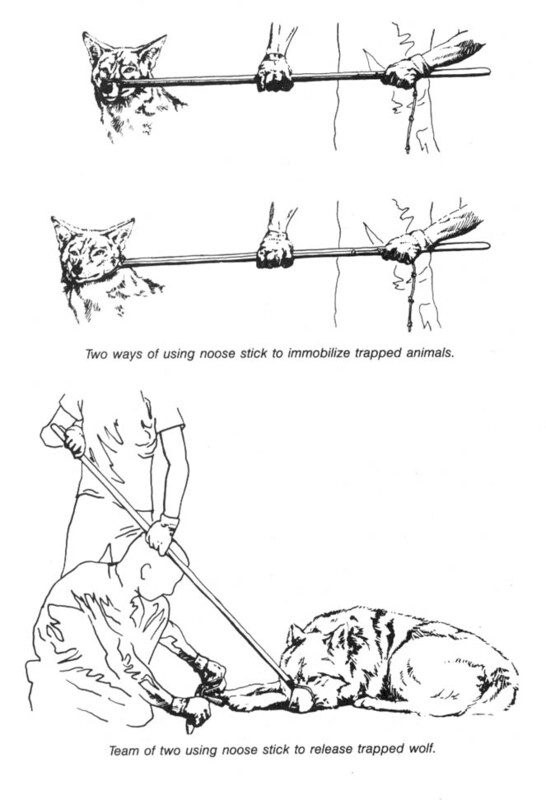 (The same principle of pulling the animal tight away from the trap applies to noose-pole releases.) With the forked end of the stick pinning the animal’s neck, lodge the other end into the front of your shoulder and use your body weight to hold the animal down. This frees both hands the open the trap. — If there are two of you, the one securing the animal’s head doubles as lookout. — Never carry the trap away with you. Toss it as far as you can into trees or dense brush, down hillsides, into water, or the like. — If you use bolt cutters to cut trap chains, remember they may leave tool marks on the cut surface. Take care of this problem by cutting the link com­pletely free of the rest of the chain and tossing it in a different direction. The chances of a search turning up a single cut chain link are very small. Even if the trap is recovered, the cut link bearing tool marks will be missing. — Many people carry a broom (sometimes shortened) to sweep snow off their cars in winter. You should also, and use it to wipe away your tracks. Avoid wide sweeping moves that are obvious on the ground. Use the tip of the broom to wipe away each track one at a time, both around the trap set and on your trail as you walk backwards out of the area and back to your vehicle. You won’t be able to both work fast (which is important) and eliminate all sign, so concentrate on eliminating prints that can be traced back to you. — Accompanied by your pet dog, you can claim, if caught, that you were just freeing your dog from a trap. Act extremely irate that someone would do that to your dog. -Learn to use the weather to your advantage. Going out just before, or in the early part of a snow storm may mean a blanket of fresh snow will hide your activity. This is not a substitute for wiping away your footprints, just an added advantage. Follow weather reports closely and learn by studying local weather patterns in the area where you operate. — If operating on foot in snow, have two or three pairs of winter boots (cheap moon boots are good), each with different soles. After working a trap line, retire the boots you were wearing for a few weeks at least. If that sole print is evident in the snow around your home, tromp around in a different pair of boots to obliterate the prints. A visiting game warden might be curious about tire tracks and footprints that may resemble those found near the scene of sabo­tage. — If stopped and questioned, be friendly and give your rehearsed cover story. If questioned at home, don’t deny traveling around the area to hike/hunt/cut firewood, etc. If more than a day has passed, be vague and uncertain. Tell them you went a lot of places that day. Remember, an investi­gating officer might consider you a possible helpful witness rather than a sus­pect. Play the part. – Be aware of ground conditions. Warm weather may leave bare ground that won’t take footprints readily. Doing your work early in the morning or during cold snaps may let you do most of your walking on hard frozen ground. South facing slopes and windblown areas are most likely to have bare ground but watch for mud. It’s better to leave tracks in snow that will melt than in soft ground that will only harden and preserve your footprints. – If only trappers use a certain road, consider accidentally dropping nails for their tires (or other tire-flattening methods discussed elsewhere). Do so near a recognizable landmark so you can remove the nails after trapping season. Another insidious trap, used against small game, such as rabbits, and predators, like Coyotes and foxes, is the wire snare. This device consists of nothing more than a loop of lightweight cable or braided wire (as is used to hang picture frames) set in a place where animals will likely pass. (See illustrations.) The snare works like a miniature cowboy’s lariat, tightening around anything unlucky enough to pass through it. It is draped over small branches around an animal trail or outside an animal’s burrow. Stockmen and government trappers will put them in low spots that Coyotes dig for trails under woven wire fences. Corners where two fences come together are especially popular. As the animal passes through the noose-like snare, it tightens about her neck and slowly strangles her. Smaller animals are frequently snared around the middle of their bodies and may be almost cut in half after a prolonged and fruitless struggle. Usually, you must look closely to spot snares. When you find one, cut the wire in an inconspicuous manner, perhaps close to the point where it is anchored or tied, or in a spot hidden by brush or loose dirt. This will insure that it cannot strangle any passing animal. If you take the entire snare, the trapper will simply and cheaply replace it. Make the snare look perfectly normal after disabling it, and the trapper will be none the wiser. This handy tool can be used while browsing through the fox, Bobcat, Lynx, Badger, Beaver, Cougar, Coyote, Ermine, Mink, and Muskrat coats at your “favorite” fur shop. The “coyote getter” consists of an inexpensive air brush modestly cus­tomized. Badger makes one for around $35 (model #350) including hose and bottles. An 11 ounce can of propellant runs about $4. Modify a cheap pair of gloves so you can conceal the brush and tip in them. Cut a small hole in the glove just large enough to expose the spray tip. Paint the tip the same color as the glove. Use tape or rubber bands to fasten the brush to your hand and wrist (put the brush in your palm and use your thumb to press the trigger). Run the air hose up your arm and down to your coat pocket (the coat should have a hole cut in the inside of the pocket for the hose to come through). Fill the paint bottle (carried in your coat pocket) with your favorite fluorescent dye or paint, and hook up the hose to the propellant can. While browsing, surreptitiously “decorate” the coats where they won’t be immediately noticed from the aisle, and leave. The wire or cable snare is another trapper’s tool designed to strangle an animal to death. B) Snare set in crawl hole under fence. C) Snare set on trail. Tilted branch keeps larger animals like deer and livestock away from snare. This trick also used with leghold traps. D) Snare set on a log crossing a stream. * Browse through the fur coats on the rack at your local classy department store with a razor blade concealed in hand. Slice the lining of the coats from the inside as you admire them. One of the ugliest sights you are likely to encounter while traveling about the West is the all-too-familiar dead Coyote dangling from a rancher’s fence. Never are you presented with a better reason to stop straddling the fence and start cutting it. The tactics used will vary depending on whether you’re in your neighbor­hood, or just passing through. Your primary consideration must be to avoid being caught, since small town juries and judges in ranching country are not likely to sympathize with a goldang Coyote lover. When you first spot the dead coyote, DO NOT stop or even slow down to look. Casually look about to see if anyone is observing you or working in the area. Drive out of the area and wait at least ten minutes before driving past the scene again. On this second scouting run, use your odometer to measure dis­tances from landmarks that will be visible at night to the scene of the crime. If necessary, make brief cryptic written notes of distances, but remember to burn the note after committing the key information to memory. Your notes might read, “Hwy. junction 21.5-gully 22.1-m.p. 145 22.7-X [marks the spot] 23.2-bridge 23.9,” and you will memorize that the target is 1.7 miles from the highway junction, and one half mile past milepost marker 145. If you approach from the other side, you know it is seven tenths of a mile past the bridge to the target. This precise pinpointing of the target by distance will keep you from making the classic error of cruising the rural road or highway in a slow and conspicuous manner while you squint into the darkness hoping to glimpse the dead Coyote. Always assume it will be hard to spot at night. Wait for a suitably dark night, and have a trustworthy companion drive while you cut. Approach when there is no other traffic. You may have to drive by more than once to accomplish this. That is why you need landmarks and mileages from both directions. If the area has homes or ranches located next to the road, don’t drive by more than a couple of times. It’s safer to wait for another night. After all, that Coyote isn’t going anywhere. When you make the hit, try to leave the vehicle on the road, rather than leaving traceable tire tracks on the shoulder. You will, of course, be wearing dark clothing, smooth-soled shoes, and gloves. Your cutting tools will be thoroughly wiped clean of fingerprints in case you drop them or have to ditch them. Wire cutters might suffice, but a fence tool is best (see the section on Grazing in the Developments chapter). If the target is located near a house, consider having your partner drop you off nearby to let you approach it on foot. Carefully pre-arrange the time and location for your later pickup. Have a backup time and place in case anything goes wrong. You may also want to carry a pepper spray (see the section on Dogs in the Security chapter) in case man’s best friend gets rowdy. Drive away from the area at normal speed to avoid suspicion. You may want to bury or otherwise dispose of the wire cutters since they are probably the only thing short of a confession that can positively link you to the crime. That safety and peace of mind are well worth a few dollars. If you are questioned as to why your car stopped out there that night, you can always say that you stopped to take a leak, or that something ran out in front of your car and you stopped so fast you stalled the engine. If you are traveling through the area, you may want to do your fence work immediately. Always carry a dark plastic bag with some dirty, empty aluminum cans in your car. Pull off the road and pretend to be picking up cans. When the coast is clear, check one last time. If it’s still clear, whip out your trusty cutters and quickly, but casually, go to work. Don’t ever run in broad daylight as this looks mighty suspicious even from a long way off. In daytime, you should only do as much cutting as can be accomplished in 15 to 30 seconds. Casually stroll back to your vehicle and leave at normal speed. Do not stop anywhere in the area unless you are desperately low on gas. Leave the county. Cross at least two county lines before stopping for the night. If the state line is nearby, modify your plans and vacation in another state for a while. Changing to a different highway might throw off a deputy or highway patrolman checking travelers for the elusive Coyote lover. Admittedly, all of this seems awfully elaborate for a little fence cutting, but your Coyote-killing rancher will consider a crime against his property to be just about a capital offense. In Texas, where a lot of stockmen favor this type of fence decor, it is a felony, punishable by up to five years in prison, to cut a fence. This law is a hold-over from the open-range fence cutting wars of the 1880s and 90s, but it is still on the books, and might be used on you if you get cocky or careless. On August 26, 1992, President Bush signed into law the Animal Enterprise Protection Act of 1992. It establishes as a federal felony attacks on zoos, cir­cuses, rodeos, livestock facilities, aquariums, and labs where damages or research losses total $10,000 or more. This, of course, means that the FBI may investigate such raids. An FBI agent said, “We consider these acts to be domestic terrorism in every sense of the word.” The FBI is currently cracking down on suspected animal rights activists. Several people are sitting out the year in federal prison for refusing to testify before federal grand juries, and some well-known activists have gone underground to avoid being hauled before grand juries. One wonders when lunatic fetus-worshippers who are bombing family planning clinics and murdering doctors will get the same attention from the Department of Justice.